I spent an hour yesterday in a lively phone conversation with the drafters of “Drowning in Paperwork, Distracted from Purpose” a report on the challenges and opportunities in improving grant application and reporting. The call was hosted by the Association of Fundraising Professionals which is one of the partner organizations participating in Project Streamline, a collaborative initiative of the Grants Managers Network. Though I’ve already referenced this effort in an earlier posting, I wanted to remind you to go the the website of Project Streamline, download a copy of the report and its recommendations, and add your feedback to the discussion. The need to rightsize the application process to the amount of the grant. The need to focus proposal writing on the right stuff, (program and results), and not take up time with excessive paperwork. The need for better online application processes (ones where you can save your document, copy and paste, print out versions to check, etc). The need for open source final reports so that our colleagues can learn from our experiences (rather than reports locked in a file cabinet that no one pays attention to). The report is a good read. It may confirm all of your frustrations. If a fair amount of your revenues come through private foundation grants, it’s well worth your involvement, especially if you have recommended solutions to the problems addressed. Unfortunately, the vast majority of grants and contracts which nonprofits receive come through the government … which isn’t a beneficiary of this study. But the project sponsors were urged to share the report with government grantmakers anyway as they may benefit from its recommendations. Peter Block’s new book offers insights for rethinking the way we make change in our communities. With the party conventions opening today with the Democrats in Denver, I couldn’t resist this quote attributed to Helen Gahagan Douglas. As you may know, I’ve been very concerned about the growing trend in our sector to undervalue the contributions of the tiniest of the organizations and associations among us. While I know that there are many organizations of the smallest size that no longer exist or are barely scraping by, I also know that some very powerful and transformative work is happening down in those grassroots trenches … whether that work is the one-on-one mentoring from a sports coach to the community preservation advocacy of a small neighborhood association. So it’s great, for a change, to read a book by someone who really gets it. I’ve just finished my first read through of Peter Block‘s latest book Community, the structure of belonging and believe it is a must read for anyone who is thinking about community and social capital. 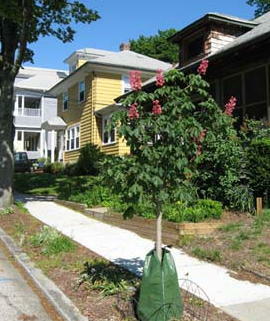 This is the red chestnut that we planted last fall in front of our house through the Providence Neighborhood Planting Program. My wonderful neighbor Anisa Raoof took it upon herself to recruit a group of neighbors who, in exchange for receiving free street trees, agreed to help plant, water and nurture them. In October, neighbors assembled with shovels, rakes and hoses to work with the City Forester and crew to plant 16 new trees up and down our street. Kind of like a barn raising, only for trees. Half of the cost of the trees is paid for by the city. The other half comes from the Mary Elizabeth Sharpe Street Tree Endowment. Through the commitment of the late Mary Elizabeth Sharpe and her environmentalist daughter-in-law Peggy Sharpe, Providence has one of the most progressive street tree planting programs in the country. The street tree program is brilliant. The tantalizing offer of free street trees brings neighbors together in a collaborative effort that is the best of urban community. With each tree planted, the city moves closer to its goal of a 30% canopy cover (up from its current 26%) by 2020. And all of us benefit from the beauty, shade, lower utility bills, interception of storm water, cleaner air and wonderful birds and other wildlife that trees bring us. Plus, trees boost the property value of homes by up to 10%. So each time I look at my beautiful new red chestnut, I’ll be reminded of the extraordinary impact that just a few people.. through their philanthropy, community partnership and general neighborliness … have made possible. We just wanted to let you know that you can find a free pdf version of our booklet, Meaningful Participation, an activist’s guide to collaborative policy–making in the products section of our site. Click here to download the file.